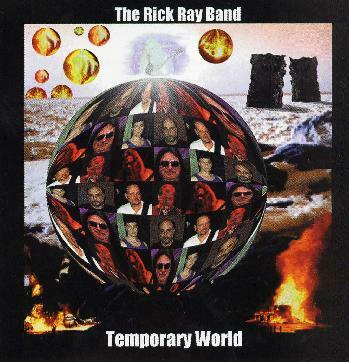 The Rick Ray Band - "Temporary World"
Another year and at least one new Rick Ray CD appears. This one is quite a different project though with a lot of different people involved, including the lead vocalist, Chuck Abraham, Frank Pellino (guitars, keyboards), Jack Ambrose (Bass, vocal on one track), Sam Glorioso (Drums) and Rick's main music partner, Rick Shultz on Reeds. Most all the songs are composed as band as opposed to Rick doing everything. As usual, the lyrics are quite positive. The opening track, "Until the End" is a great number and you get to hear Chuck belt it out. I think some people will like his singing but I can see that many will not like his voice much. The tracks on this CD are a bit longer than the normal Rick Ray CD, with most tracks over 6 minutes. "Rumor Clinic" features a long solo by Rick Shultz and some cool bass playing to support it. "X in the Sky" features the vocals of Jack Ambrose and they are a bit distorted sounding (perhaps on purpose?). "Modified Universe" is an all instrumental track and quite cool. "Change Stays the Same" is next and is a more upbeat track and features some intense playing hidden in the track. "Chemical Dispersion" features Rick on lead vocals. The guitar track sounds very similar to the riff from one of the earlier tracks but this track features a cool lead organ solo by Frank. "Passage of Time" features Rick playing some great acoustic guitar. The title track features some of the nicest playing from everyone on the whole CD. The CD ends with "Alteration". The most unfortunate thing about this CD is that this band did not record in a proper studio as the drum sound and vocal recording is variable from good to quite poor. Well, if you liked Rick Rays previous stuff, then you will enjoy this one as well. For more information you can visit the Rick Ray web site at: http://groups.msn.com/guitaristrickray.